Window in the southern transept of Cologne cathedral by Gerhard Richter. Image courtesy of Derix Glasstudios GmbH & Co.KG, Taunusstein. The 19th century Romanticism with it’s enthusiasm for the middle ages brought also the Stained Glass Window back into sight. House of Sir John Soane in London, built 1808-24. The copyright on this image is owned by Peter Barr and is licensed for reuse under the Creative Commons Attribution-ShareAlike 2.0 license. There are spectacular examples, full of fashionable nationalism like the Bavarian Windows, given to the Cologne Cathedral by King Ludwig I. These Windows were obviously intended to orientate the citizens of Cologne towards the east, away from France with which Colgone shares more than just the same side of the Rhine. Irony of fate that the very Ludwig I became the only German monarch who had to resign in 1848’s revolution – just in the year when the Bavarian Windows had been opened. Stained Glass in art history has rarely managed to get regarded anything other than just craftwork. Too dreadful are the vestiges – crown glass windows painted with horse and carriage at bawdy beer halls of the 1930s, or Gothic-nationalistic kitsch like the windows described earlier. That sifted down through tinted window panes. The metaphorical denotation of light had changed. Thereby we get to an important aspect of designed glass windows: They had been not (just) part of the architecture but rather media, created for reading. The earliest preserved stained glass windows can be found in the cathedral of Augsburg: three prophets, likely from a larger series, approx. 1060 A.D. with already completely distinct material and type of representation that we know from the successive four centuries. Small, dyed pieces of glass put together with bands of lead, partly covered with drawings in brown enamel paint or silver pigment. In the first instance they serve as Biblia Pauperum, i. e. as pictorial illustration of theological content for the church’s visitors who at that time usually where not able to read. The second layer is an image of “Heavenly Jerusalem”. Of course the medieval man was at first overwhelmed – not getting any colours in sight outside the church apart from brown, green and the blue sky. The stained glass of the cathedrals was as precious and expensive as real gemstones. Deep read, so called Gold Ruby for example was obtained by blending nanoscopic gold particles. 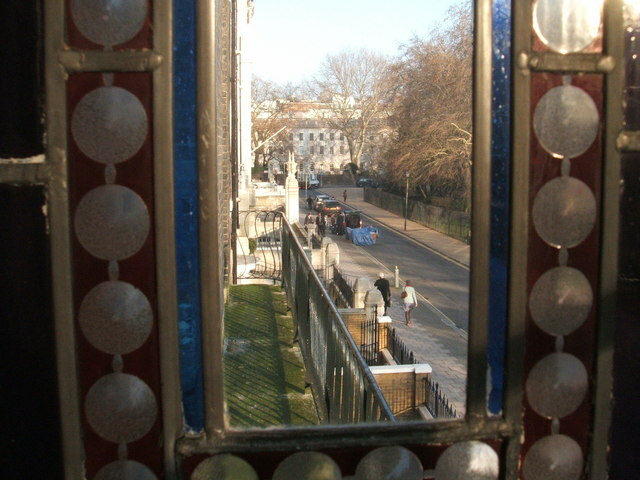 Thus during the Gothic times glass was not just seen as mere substitute for genuine gems. Like with the glass, the gemstones had been assigned their meaning because of their coloured translucency. The diaphanousness opens the third and spiritual layer of meaning: the light itself is inscribed by colour and content of the pictorial windows, it is transcorporated like the Holy Water. This idea of a “light baptism” is truly the most original aspect of medieval glass art. 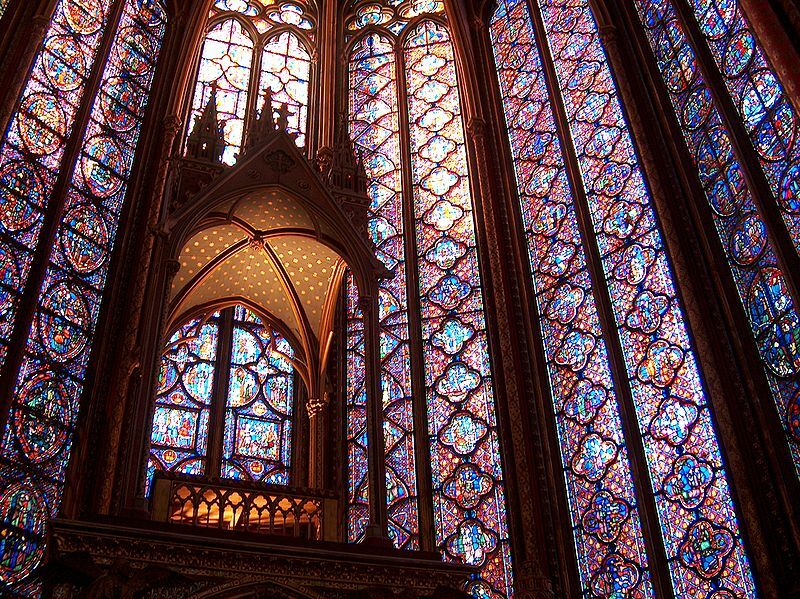 The most spectacular example in my opinion gives the Sainte Chapelle at Paris. As mentioned in the beginning, the renaissance of tinted Glass windows in the 19th century has been completely eclectic and shows hardly any discretion – not to speak about subtle, spiritual layers of meaning like in the middle ages. It took not until the 20th century to generate creations of glass that could rightly be seen as works of art again. 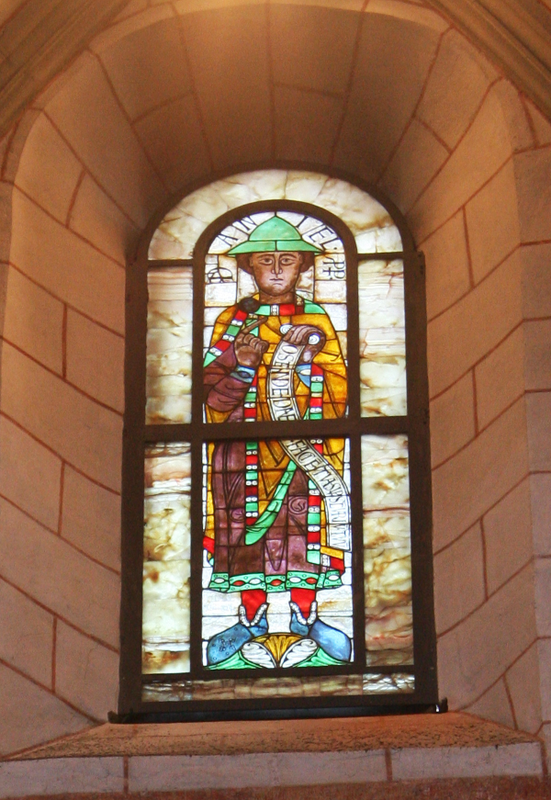 Obviously many of these works are used in church buildings: Le Corbusiers Notre-Dame-du-Haut at Ronchamp has many little coloured windows, but these lack the medial character – the panes remain architectural decoration. A different thing is the wonderful glass collage by Rupprecht Geiger – sacral like the Baptistery Window in the Evangelische Apostelkirche at Stockdorf – or profane like at the stair case at Munich’s Technische Universität (at cross section Theresienstreet, Luisenstreet). Geiger manages without any eclecticism to find an abstract form of expression in his glass windows. 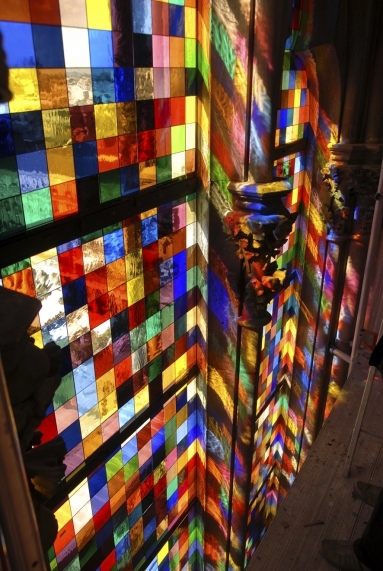 The window of the southern transept in Cologne’s cathedral by Gerhard Richter also has all the distinct layers of meaning. The hue is taken right away from the production of the Gothic glasses. A Poor-man’s-bible, this is made clear by Richter, is no longer needed in our world of technically reproduced and seemingly objective images; and so he distinguishes his work from the usual wood-cut sacred kitsch that reminds to Ernst Barlach. Human words and images step completely back; nothing is abstracted, nothing transferred from reality into image. The coloured panes are arranged by mere random within each field; but the very fields are mirror symmetric one to the other. In this global symmetry the local contingency is dissolved. Thus the aspect of Gothic light mystics gets fully visible again. 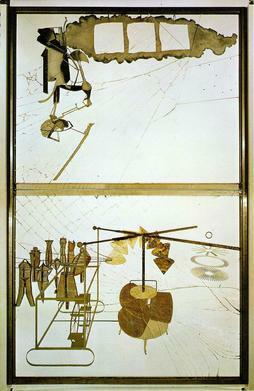 One glass picture marks properly a turning point between epochs: the Large Glass by Marcel Duchamp, 1923. It is the pivotal point for Duchamp himself and represents like rarely another work of art the whole 20th century. Art, the Machine Célibataire, the Bachelor Machine. Next Next post: Scientific American – my first 30 years.